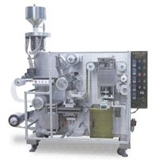 China Automatic Blister Packing Machine Suppliers, China Automatic Blister Packing Machine Manufacturers. This KDB-240 is a high-speed double linesautomatic blister packing machine.It automatically heats the PVC then forming,feeding, sealing, embossing, perforating &trimming.It can be used for the pharmaceutical packing(tablets, capsules, pills, and etc...), food and othersimilar products packing.Max. Capacity: 400 Blisters/Minute.